Welcome to June 2017 Curious Tea subscriptions! As always we have some new and exciting teas to share with our subscribers this month. This month we have a special selection, which consists only of Chinese teas from spring 2017 harvests. We selected the following four fresh and delicious teas for you to try this month. The first tea is Ya Bao Silver Buds, a unique pure young bud tea made from a Camellia varietal native to Dehong region of Yunnan Province that produces a very light liquor with a surprisingly complex flavour. 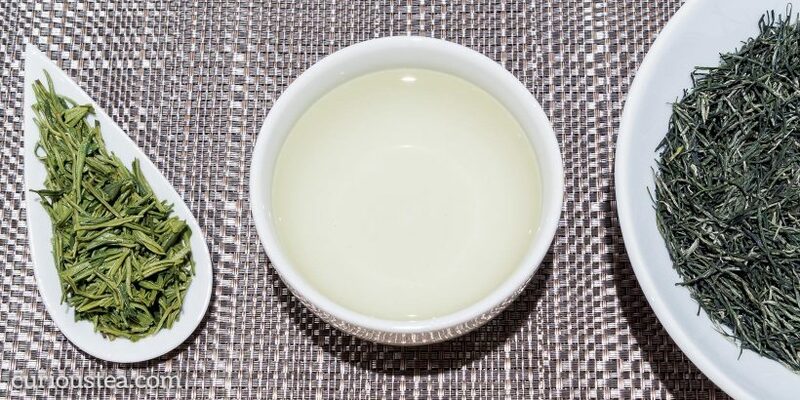 The second light tea, Xin Yang Mao Jian from Henan Province, is one of the top 10 famous Chinese teas and features a rather vegetal profile that is sweet and full of umami flavours. For the darker side of the selection, we opted for an unusually light and fruity Dian Hong Ai Lao Mountain, that is made in a Taiwanese style in Yunnan Province. And finally we have a Bai Lin Gong Fu, a real classic Chinese black tea from Fujian Province that is superbly smooth and balanced with a sweet and malty profile. Mixed: Ya Bao Silver Buds and Dian Hong Ai Lao Mountain. To help you along with the tasting, here is some further information on all teas featured in our June tea subscription boxes. Ya Bao (芽苞) Silver Buds is a rather unusual pure bud tea originating from Dehong Dai and Jingpo Autonomous Prefecture in Yunnan Province of China. This tea is hand plucked from wild growing trees of Camellia sinensis var. dehungensis, a tea tree varietal native to the high mountain regions of southern Yunnan that is favoured for production of pu-erh teas. This particular batch was picked and sun dried in February 2017. The leaves are plucked very early in spring when the trees just start producing the smallest of new growth. After plucking, these buds are simply dried in the sun in order to remove any moisture and no further processing is carried out. This tea really is a white tea, however it is also sometimes sold as a pu-erh or a ‘white pu-erh’ as it is made from buds from the same Yunnan trees that are used for producing pu-erh teas. It also undergoes processing that is more akin to a young Sheng Cha (生茶) Pu-erh. Young buds of this tea are simply dried in the sun, leading to slight oxidation during sun drying. So this white tea is closer to a Mao Cha (毛茶), which is the loose-leaf form of young Sheng Cha Pu-erh and is the starting point for a pu-erh tea. The dry leaves of this Ya Bao have an unusual appearance of whole small buds. The dry tea has a woody and earthy aroma. When brewed, this tea produces a light and bright liquor with a very faint colour. The taste, however, is surprisingly complex. There are prominent woody and earthy notes with hints of pine and hops on the palate. 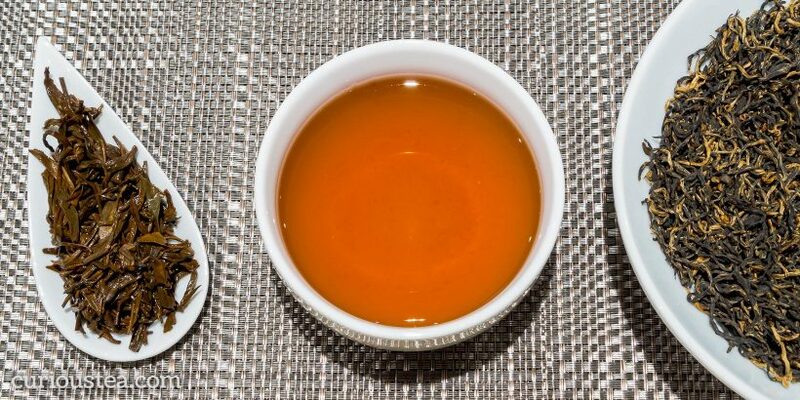 This is a satisfying cup of tea that has a mouth watering effect and a long lasting, slightly fruity and sweet finish. You can also buy Ya Bao Silver Buds white tea in our online shop. 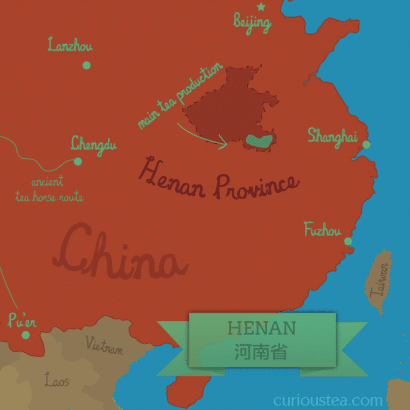 Xin Yang Mao Jian (信阳毛尖) is a truly superb green tea from Xinyang in Henan Province of China. 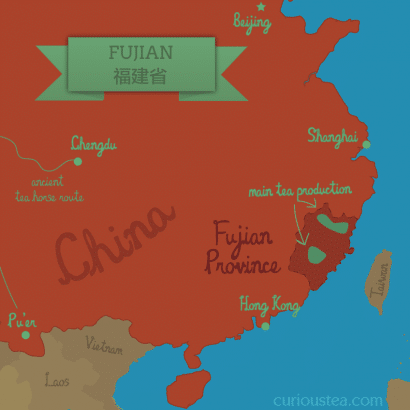 This famous green tea has a history spanning over 2,300 years and is listed as one of the top 10 famous Chinese teas. It was harvested from tender young leaves in the middle of April 2017. Tea plucked at this time is referred to as ‘Yu Qian’ tea, which falls between April 5 and April 20, just before the Grain Rain Festival (Gu Yu, 穀雨). The name ‘Mao Jian’ translates as ‘fur tips’ and it refers to the appearance of the young tea leaves when they are plucked – they are covered with tiny ‘hairs’ or ‘fur’. This rare tea is very time and labour consuming to produce, as approximately 50,000 buds need to be plucked to make only 500 grams of finished tea. After plucking, the leaves of this Xin Yang Mao Jian green tea are rolled and pan fried, resulting in compact needle-like dry leaves. The dark green dry leaves of this tea have a lovely grassy and fruity scent. When brewed the liquor is light green in colour with a vegetal and nutty aroma. The taste is quite complex but balanced. The liquor has a thick and juicy profile with fresh vegetal, grassy and slightly fruity notes. The initial taste has top sweet notes followed by a deep and long lasting umami aftertaste that is somewhat savoury. This tea produces a complex and satisfying infusion that is very refreshing on the palate. We suggest brewing at 80°C for 2-3 minutes according to your taste. It can be brewed around 3 times depending on your preference. This type of green tea is also great for cold brewing. Simply mix tea and cold water (ratio of 10g of tea to 1l of water) in a bottle or jug and place in the fridge overnight. You will have a refreshing and healthy cold tea drink the next day – great on a hot summer day! You can then top up the water and keep re-infusing the leaves until no flavour is left. You can buy Xin Yang Mao Jian green tea in our online shop. 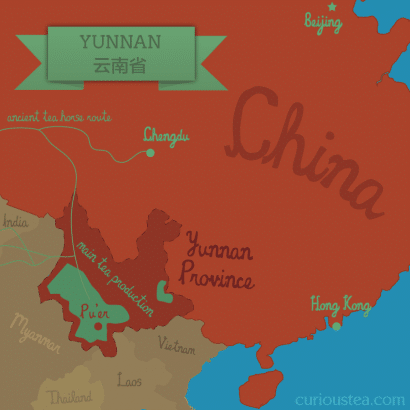 This tea is quite different to most Dian Hong teas, being less malty, lighter and fruitier. The farmer has a background in Taiwanese teas and this is evident in the style of this unique tea. The levels of oxidation are somewhat lower, resulting in a light, sweet and fruity style of tea. The wiry dark brown leaves of this black tea from Ai Lao Mountain have a bit of gold colour to them and a slightly malty and fruity aroma. This tea produces a subtly amber liquor with a very light malty scent of eucalyptus and pine. You can see the lower levels of oxidation on the brewed tea leaves – they still have some dark green colours! The light and balanced liquor has a slightly malty taste with a woody eucalyptus note. The flavours have fruity and stony notes with a sweet brisk aftertaste. The clean finish means this tea goes well with food, especially sweets. You can also buy Dian Hong Ai Lao Mountain black tea in our online shop. Bai Lin Gong Fu (白琳工夫) is a classic black tea from the famous Fuding tea growing area of Fujian Province. 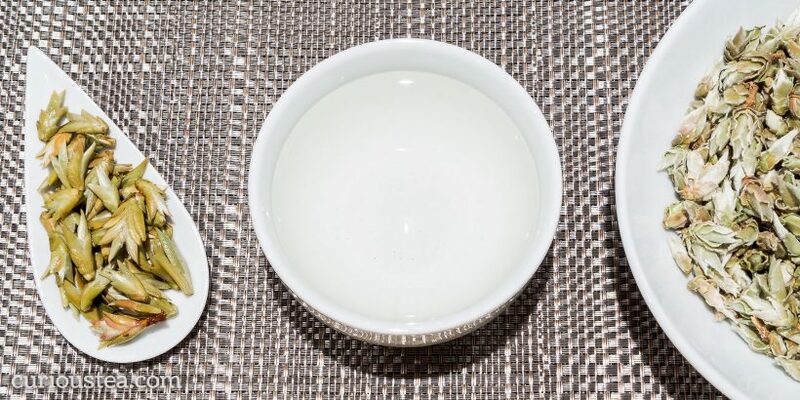 It is made from a Fuding Da Bai Hao ‘Large White’ local varietal that is usually used for making Yin Zhen Silver Needle, so Bai Lin Gong Fu is essentially a black version of this famous white tea. Hand plucked and carefully processed, it has a classic Chinese black tea profile that is captivatingly alluring. This batch is from April 2017 harvests. This tea is named after the place where it originates from, Bai Lin Zhen (白琳镇), a town in Fuding. Gong Fu (工夫), same as Kung Fu, is the Chinese term that refers to great level of discipline or study in a particular field. In case of teas, it refers to the skill required to make a particular style of tea. These type of teas have also been known in the West since the 19th century as Congou tea, a term deriving from the Gong Fu term. In modern terminology the meaning that is best ascribed to the term ‘Gong Fu’ in our opinion would be the English word ‘artisanal’ as it indicates a tea that is made by hand using traditional techniques and methods that require great skill and knowledge. 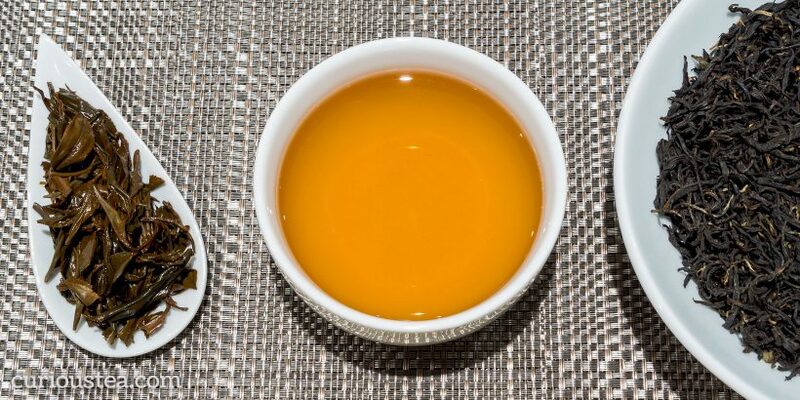 The wiry dark leaves of this black tea have a beautiful golden black appearance. The liquor has a dark amber colour and a malty aroma. The taste is very balanced and smooth with no astringency or dryness. There are malty and floral notes, a woody edge and a satisfying long finish of cocoa and rose. Overall the flavours remind of a chocolate covered rose Turkish delight! You can also buy Bai Lin Gong Fu black tea in our online shop. We really hope that you enjoy the tea club selection for June and are looking forward to our selection in July! This entry was posted in Monthly boxes and tagged black tea, China, green tea, white tea on June 15, 2017 by Curious Tea.